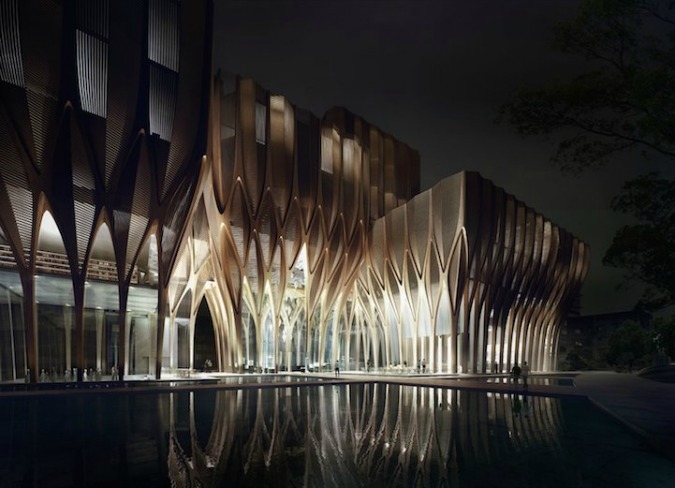 World-renowned architect Zaha Hadid has unveiled designs for the new Sleuk Rith Institute, a leading center for genocide studies in Asia to be located in Phnom Penh, Cambodia. 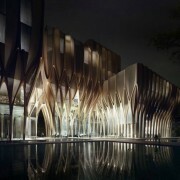 Hadid, typically known for her flowing concrete buildings, envisions a unique aesthetic for the institute in the form of five wooden structures that interweave and link together as they rise upwards. The five buildings will house spaces for different functions, which will be connected at various levels throughout the structure, allowing for interaction and collaboration underneath a complex, interlocked structure inspired by the architecture of Angkor Wat and other ancient sites. (source).